Think about the Black Swans in your life. For me, they have been, among other things: a childhood trauma that caused my personality to split (later stitched back together), meeting a few key people that changed my thinking and the course of my life (some pleasantly, some not so pleasantly), reading a few life-changing books that opened my vision (Taleb’s Black Swan was one of them), and most recently, the sudden death of my brother (which has caused me, in a new way, to focus all my energies on what matters most). These events were unpredictable, and have completely changed my life. They are my Black Swans. I would say I am who I am because of, not in spite of, these events. But the events I listed, other than the positive meetings and readings, don’t sound very pleasant, do they? Trauma, painful relationships, death – isn’t it better to try to avoid these things, and other mistakes, stressors, uncertainties and mysteries, or at the very least, to move beyond them as quickly as possible? Not necessarily, and maybe not at all. 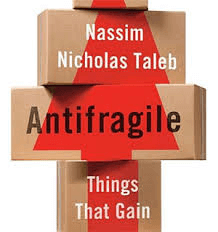 Taleb has coined the word “Antifragile” to give language to the concept of the “opposite of fragility.” In short, and speaking necessarily within certain limits, Fragile things break under stress (a teacup that falls to the floor), Robust things remain intact under stress (a rubber ball that bounces back from the floor), and Antifragile things get stronger under stress (our muscles when we walk or jump on the floor). Emotionally and psychologically speaking, we are fragile when things like change, trauma, pain, loss, and mistakes weaken us, or break us altogether. Or when the mysteries of life cause us to lose our sense of self. We are emotionally antifragile not when we are robust or “unbreakable” (like the rubber ball – unchanged by stressors, which would be unrealistic in our dynamic world), but rather when we get stronger as a result of them. In Taleb’s terms, Antifragile people not only do not resist Black Swans, but – to some extent – seek them out. We, as humans, are dynamic organisms which are an interdependent part of a larger dynamic universe, in turn perhaps, an interdependent part of other larger universes, ad infinitum. Understanding that dynamic organisms, like dynamic systems, need polarity and contrast, a certain measure of unpredictability, mystery and even chaos to continue to be dynamic, is a crucial part of accepting and fully living our physical and psychological (and emotional and relational) lives. Put simply, we need conflict and random changes to continue to be dynamic. And using antifragility as a measure, we can aim to regenerate ourselves continuously using, not suffering from, random events, shocks, and other Black Swans in our lives. In modern scientific parlance, Antifragility calls to mind stochastic resonance – the fact that noise and random disturbances in life systems can actually strengthen and enhance the amplitude of the system’s signals. In eastern philosophical language, it calls to mind two key concepts on the path to enlightenment: those of non-resistance to and gratitude for the trials that ultimately strengthen us. We think of the person who credits her experience of cancer as the catalyst to her true growth, or the gifted person who has suffered from misunderstanding, but has used that suffering as a catalyst for greater understanding and meaningful application of his potential. It is the practice of using everything that comes into our life as a source of vital energy on our path to the realization of the Self – and not only the “good,” expected, or desired. This change of attitude frees up precious mental space and significantly reduces our anxiety about the future and the unknown. Normally, we spend an enormous amount of energy trying to measure risk (both physical and emotional) and prevent future events. Taleb (along with the masters) remind us that this is largely wasted energy. The more our world becomes complex (just think of the complexity of the internet), the less we can accurately predict, and the more useless our effort to measure risk and predict events. What we can do in the present is take measure of our own fragility to change (the level to which we will “break” under stress), and work to increase our antifragility, or positive reactiveness to dynamic change. Thus, when the inevitable event arrives, we are ready to benefit, rather than suffer from it. This is an incredibly important point, which helps us answer a common fundamental question that arises for individuals on a path of Self discovery, those practicing meditation and trying to understand other forms of “being here in the ‘now’”: How can we stay in the now? Taleb points out that while the future (risk and future events) remains hypothetical and unmeasurable, fragility and antifragility are part of the current properties of an object (part of the current properties of our self-constructed personality, as it applies here). That is to say, we are fragile or antifragile now. We can find a measure of these qualities in our current personality, now. And if we can measure our fragility now, it follows that we can adjust it in the now. Taleb calls this fragility measuring and adjustment process “tinkering.” Information we have received about ourselves based on how we responded to past Black Swans helps us measure our weaknesses. If, the last time we made a mistake, we beat ourselves up, if we became seriously depressed after a loss, or became panicked and controlling when our partner or children didn’t do as we expected, we can observe the level of our emotional fragility. And when we are honest with ourselves, sometimes we can see that we lost days, weeks and even years to our fragile responses to change. Conversely, we can see where we responded with antifragility – we were kind to ourselves after the mistake, accepted loss with humility, and remained open-minded and self-loyal when others didn’t behave as we thought they would. We needn’t lose years to our fragility. We can “tinker” with our own ideas, beliefs, plans, behavior patterns, thought processes, and so on – and this, again and again and again – in order to improve our antifragility to life events. Nothing stands still. Everything is in constant change. We are ephemeral, as far as we know, and our existence is limited and unpredictable. One thing we know for sure, however, is that while we are here, Black Swans will determine, in large part, the major factors of our lives. How have you responded to the Black Swans in your life? Have you become more dynamic, more alive in response to them? Or have they caused you to close down? Do you waste a lot of time with your head in the future, trying to calculate, plan, and manage risk? Fantasy and anxiety can be so addictive. How could you let that go? How might you get back into the present and make creative adjustments to (tinker with) your situation now? Now, think about the Black Swans of your future. They will arrive. How will you greet them? As Taleb writes in his prologue: You want to be the fire and wish for the wind. *Taleb is a statistician and philosopher, and his main argument takes place in a global economic context. I’ve taken the liberty of translating the argument into an individualistic psychological application. The article can be read in the context of the self, the family, the business, the society, and so on. Learn more about coaching with Jennifer & get in touch to schedule a session. Jennifer Harvey Sallin, MA, LLPC, NCC is a psychologist, coach, mentor, trainer and author who dedicates her work to raising awareness about giftedness in adulthood, and supporting gifted adults to understand their unique mind and channel their uncommon potential and intensity with self-awareness and purpose. She spends a lot of her time teaching and training professionals who support the gifted and writing on giftedness and self-development. She is co-founder of Rediscovering Yourself, and founder of an international community of gifted adults, www.intergifted.com, which has an international network of coaches and mentors dedicated to supporting gifted adults. She lives in Switzerland and works locally and by Skype internationally (in English, French and Italian). Sign up to receive our newsletter with Jen's latest articles and other Rediscovering Yourself news and resources. Founded by Jen, we offer global gifted community, coaching & mentoring, courses & workshops and other events events. Join us at www.intergifted.com! Co-created by Jen & Dr. Kelly Pryde, we offer gifted-specific mindfulness courses, community, retreats & events. Join us at www.giftedmindfulness.com! Co-created by Jen & Silver Huang, we offer group programs dedicated to cultivating gifted authenticity. Join us at www.intrepidintegrity.com!